This article is a short summary of Pokémon: Let's Go, Pikachu! and Let's Go, Eevee!. Pokémon: Let's Go, Pikachu! and Pokémon: Let's Go, Eevee! are role-playing games in the Pokémon series, released on Nintendo Switch in November 2018. The game was released alongside the Poké Ball Plus accessory, which was released both separately and in a bundle pack with the game. A Nintendo Switch console bundle was also released alongside the games, featuring a console and Nintendo Switch Dock with special designs, a themed pair of Joy-Con, the Poké Ball Plus accessory, and a digital copy of either Let's Go, Pikachu! or Let's Go, Eevee! These games like the original Pokémon Red, Green, Blue and Yellow Versions (and their remakes Pokémon FireRed and LeafGreen Versions) are set in the Kanto region, and are loosely based on Pokémon Yellow which introduced a Pikachu that would follow the player, with its own emotions. The games no longer feature Red or Leaf as the protagonist and Blue as the rival; instead new male or female character protagonists, and a new male rival will take their place. 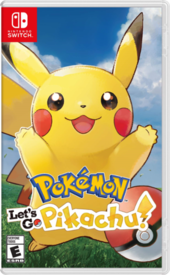 Like Pokémon Yellow Version, Pokémon: Let's Go, Pikachu! again will feature a special Pikachu who will follow the player with its own emotions, but new additions include gender differences in the appearances of male and female Pikachu (which in the core series was not introduced until Pokémon Diamond and Pearl Versions), and exclusive moves for Pikachu. Pokémon: Let's Go, Eevee! 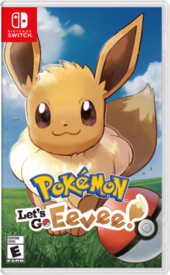 features a special Eevee much like the special Pikachu in Let's Go, Pikachu!, again with its own emotions, newly introduced gender differences in the appearances of male and female Eevee (which were never included in the core series before), and its own exclusive moves. The games will only feature the original 151 Pokémon species in addition to two new Pokémon known as Meltan and Melmetal. Meltan can normally only be obtained in Pokémon GO (which can be evolved into Melmetal with 400 Meltan Candy), but Pokémon Let's Go! Pikachu and Let's Go! Eevee will support connectivity with Pokémon GO, where Pokémon from that game can transferred into a location known as the "GO Park". These games introduce a new concept known as "Master Trainers", which are made available after the player character becomes the Champion. For each Pokémon, there will be a "Master Trainer" who specialises in raising that Pokémon and is considered the strongest Trainer of that Pokémon. For instance, the "Venusaur Master Trainer" uses a high level Venusaur. If the player challenges them, they are unable to use items, but they will be able to gain a title based on the Master Trainer they had battled, such as "Venusaur Master (player name)". This page was last edited on 4 December 2018, at 19:55.